Me and BFF went Friday and checked it out. We checked out the "garage sale" and bought a few things. I signed up for a stamp club that meets once a month. I also bought some SugarLoaf stamps, two sets for $10, hope that was a good price. Friday night we got our stuff all packed up to load in the car the next morning. Boy we didn't realize we were taking so much stuff! Luckily my neighbor let me borrow her shopping cart so it was pretty easy to transport everything. 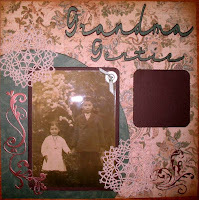 I grabbed a picture of my grandma I wanted to scrap and went off to the scrapbook store to find paper. Well that took about 30 minutes! *LOL* But I finally found the perfect paper. I worked on that page for about half the day. I answered a lot of questions about the Cricut and Design Studio. There were several ladies that had Cricuts there. I couldn't figure out how I wanted to place things on the page. I probably would have worked a lot faster at home but I kept being distracted by all the people *is a total people watcher*. I finally finished the page around 5 pm or so! I still have to do the journaling box and I think I will do it on vellum. We had wanted to sign up and take a class but couldn't think of one we wanted to take. We finally picked one and then was told the lady that was going to do it left. The ladies were very apologetic. So back to our scrap tables we went. 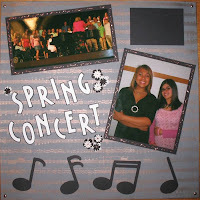 I then started working on a LO of my daughter at her Spring Concert. I had bought the musical note vellum the previous day at the garage sale. I used music notes I had designed with DS a few months ago. I still need to do the journaling and think I might add some black stickles to the music notes. The flowers were some of the prima's I got from QVC. I really didn't know if I would like the black and white flowers but they were great with this LO! We did a free make n take with Rusty Pickle paper. They showed us how to do a quick LO. I ended up doing a two page LO since they gave us 2 with flowers and 2 base papers. I still have to do a title and journal boxes for them. 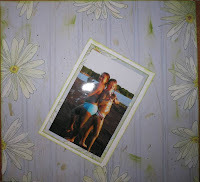 We cut the flowers out of the flower paper and then just used them to border the wood looking paper. We inked the edges and I smeared ink on the base paper. 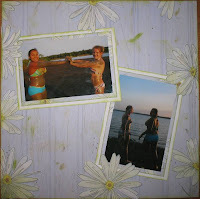 The pictures I used were take at Lake Eufaula in 2006. The water level was down so bad that year! The girls had smeared mud all over themselves and had a great time. Even though the temperature was over 100 at 7pm. They pictures just seemed perfect for this paper! We had a great time and would do it again. But next time I think I would be better organized...at least I hope. Guess I will find out in May when I plan on attending the retreat! *LOL* I am so tired today and could have used a nap. We were so wound up when we got home and unpacked last night that we couldn't go to sleep until after 2am! We had a ton of ladies from the convention stop in at Scrapbooks Galore. I teach classes there. I'd love to meet you if you ever come in or head back to Tulsa! I have some things I'd love to talk to you about concerning DS. Thanks for taking your time at the convention to tell me all about your Cricut. (I'm the lady from Seminole.) I got the Cricut and the Design software. It's really pretty daunting to a new user. I'd really like to know if you'd ever consider having a class at one of the Ada stores and share some of your expertise using the Design Studio. HI THERE!! I am always glad to talk about the cricut *big smile and laugh*! My LSS owner is trying to talk me into teaching a class at the retreat in May. It will be at the agriplex also. I guess I need to see if enough people would be interested.